All eyes are on Hurricane Harvey striking the central Texas coast, but many may underestimate the risk of compound (surge plus rain) flooding to the east, in areas like the Houston-Galveston corridor. Prolonged moderate storm surge in Galveston Bay will impede the drainage of tremendous rainfall inland and along the coast. Harvey may flood some areas of metro Houston that did not flood in Allison (2001), the Memorial Day Flood (2015) or the Tax Day Flood (2016). Harvey may flood some areas near southeast Houston-Galveston Bay that did not flood in Ike (2008), including parts of Pasadena, Clear Lake, Webster, Nassau Bay, League City, Dickinson, Kemah and Seabrook. Harvey will likely generate substantial flooding in Galveston, but it is less likely that water levels will exceed Ike (2008). Harvey will likely generate substantial flooding on Bolivar Peninsula but will not likely rival the height or power of Ike's surge. NOAA's Quantitative Precipitation Forecast (QPF) map forecasts a widespread area of rain to exceed 15 inches in the 7-day period from Thu Aug 24 to Thu Aug 31. As Harvey approaches Texas, all eyes are on the central coast from around Corpus Christi to Sargent. Harvey is forecast to make landfall as a major hurricane in this region with maximum sustained wind speeds exceeding 110 mph and a storm surge of 6-12 feet. However, this is just the beginning of a saga that could last the better part of a week. After Harvey arrives near the coast, it is likely to stall or slowly drift for days. 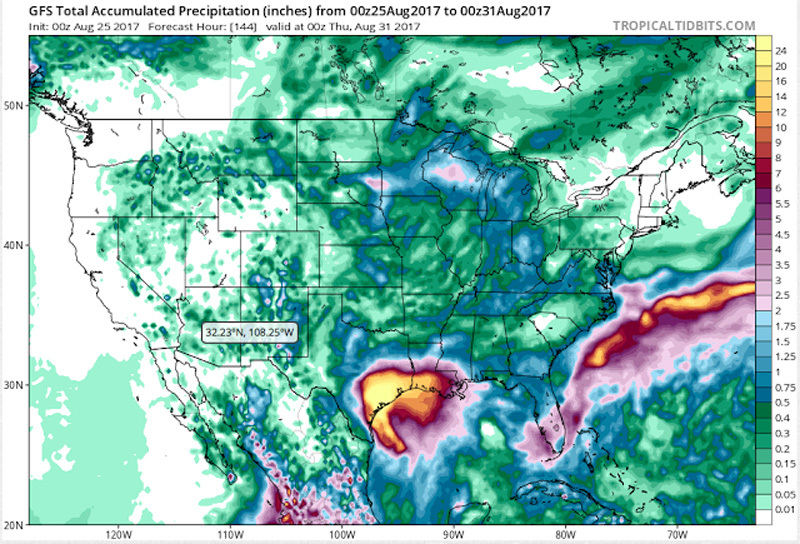 This will enable Harvey to dump tremendous amounts of rain in a widespread area along the Texas coast and inland. 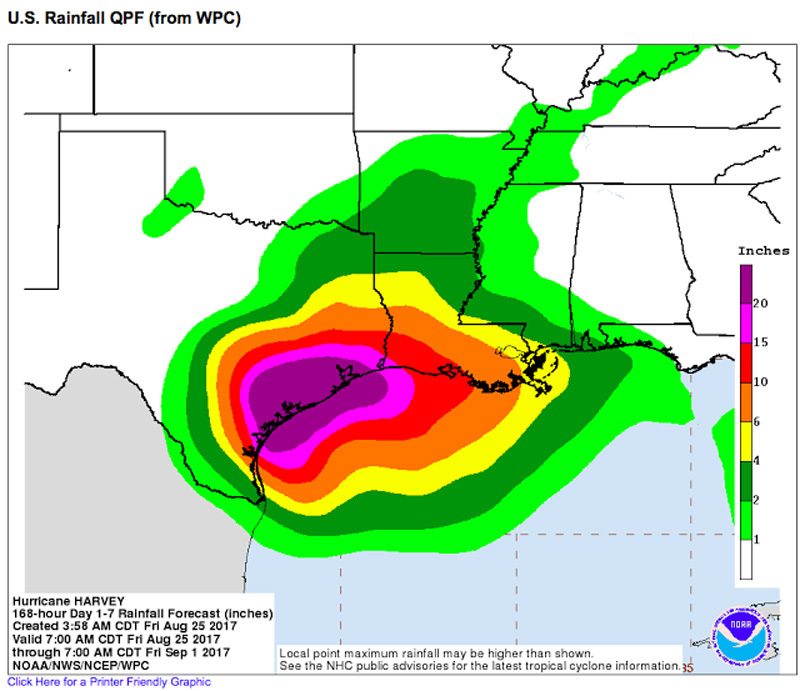 NOAA's Quantitative Precipitation Forecast (QPF) map below depicts the potential for a widespread area along the coast and inland to receive 10 or more inches of rain, with an impressive band of 20 inches plus from near Port Aransas to High Island. These tremendous rainfall totals are supported by various reliable models. For example, the GFS model run from Thursday at 7 p.m. local time depicts a widespread area of rain exceeding 20 inches along the coast and inland in southeast Texas. If these forecasts of Harvey's rainfall are verified, the rain coverage will dwarf Tropical Storm Allison's (2001) rain coverage, at least in southeast Texas. Allison generated heavy rainfall in Louisiana, Mississippi and other states after weakening to a tropical depression and then a subtropical low. The map below depicts the east-west extent in Texas exceeding 12 inches of rain extended from approximately Houston to Beaumont. GFS rainfall potential from Thu Aug 24 at 7PM CDT to Wed Aug 30 at 7PM CDT. Yellow areas depict areas exceeding 20" of rain. 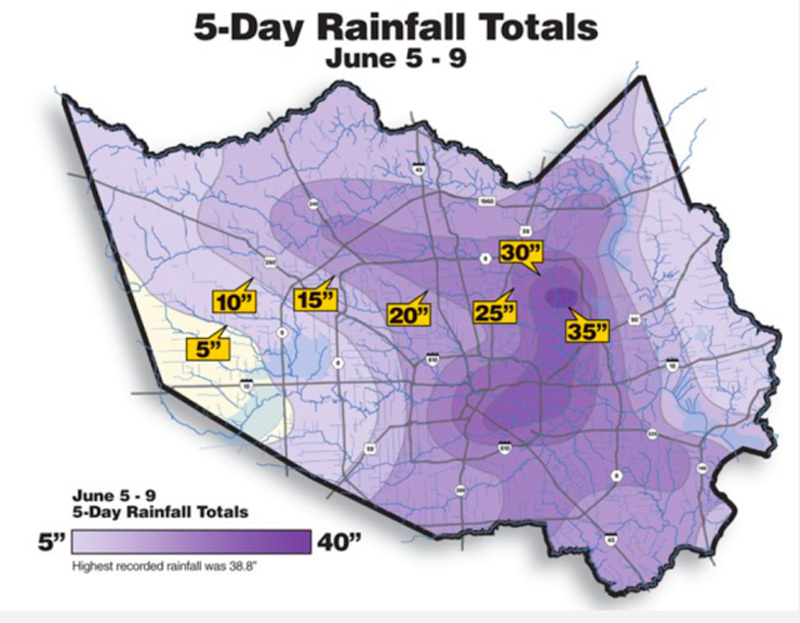 However, extreme rain events often generate localized areas with higher totals, and, unfortunately, Allison generated several pockets of extreme rainfall in the metro Houston area. The Harris County Flood Control District map below depicts a swath of rain exceeding 30 inches in east and northeast Houston. Even areas in downtown and southwest Houston, like the Medical Center, observed tremendous rainfall that caused substantial damage. 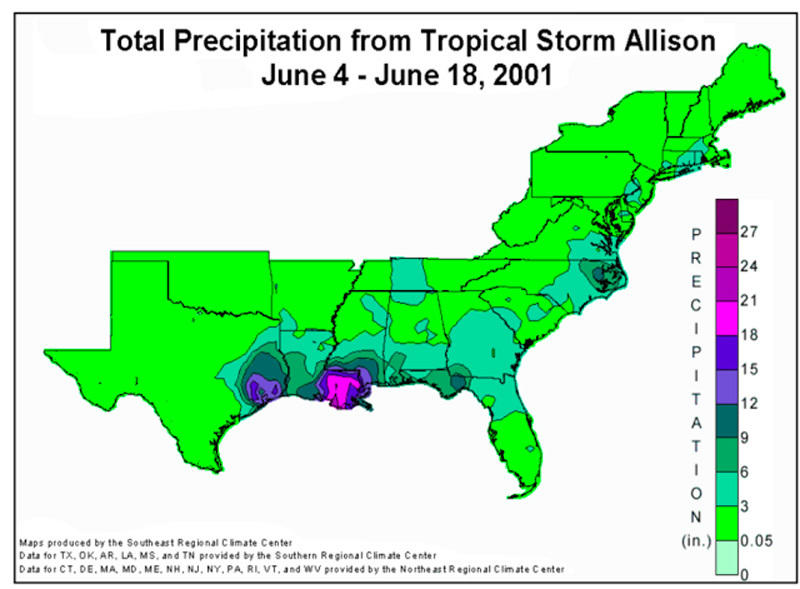 Observed precipitation from Tropical Storm Allison (2001). Yet, even on this more localized map, we get the sense that Allison's rainfall was not as widespread as the forecast rainfall for Harvey. For example, in the western portion of Harris County, west of Katy, Allison's observed rain was less than 5 inches. Map of Allison's rainfall in Harris County, Texas. Fortunately, Allison's life as a tropical storm was short-lived. It was only a tropical storm for around 14 hours, according to the track map below from Unisys Corporation. However, after weakening to a depression it drifted near the Houston metro area and dumped copious amounts of rain. Allison's short life span as a tropical storm provides an important ingredient in this story. 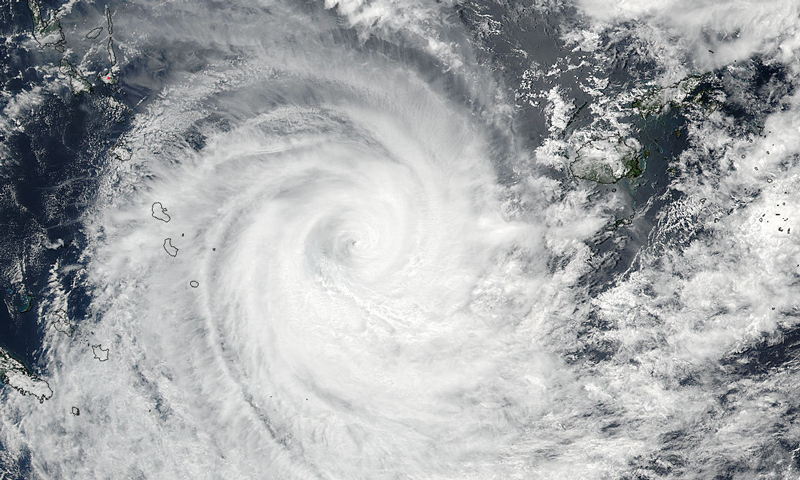 Tropical storms and hurricanes need time to build up storm surges, and Allison did not have enough time to build a large surge. Allison's peak storm surge at Galveston's Pleasure Pier only reached 3.42 feet above mean sea level. At Morgan's Point, on the inside of Galveston Bay, near Laporte, Allison's storm tide (surge plus tide) reached 3.74 ft above mean sea level, but only remained above 2 feet for less than 15 hours. 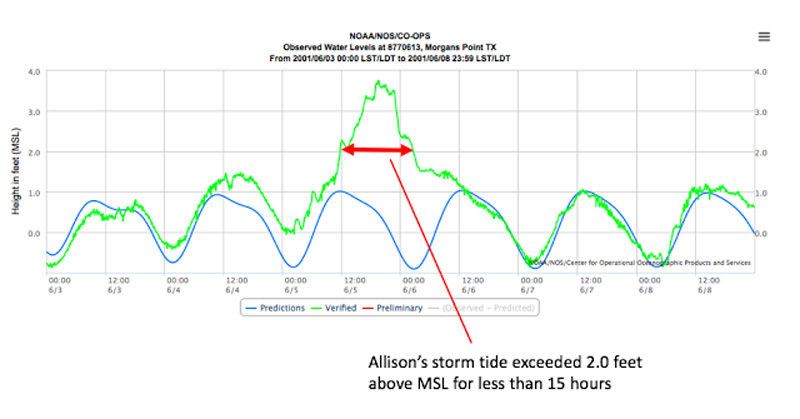 Basically, Allison produced a minor surge that came and left quickly, which enabled the tremendous rains in places like Harris County to drain into Galveston Bay relatively unimpeded. Tropical Storm Allison's storm tide. Hurricane Harvey threatens to generate a prolonged storm surge event along the central and upper Texas coast. As Harvey is forecast to stall near the central Texas coast, and the circulation around hurricanes is counterclockwise, locations like Freeport, Galveston, Galveston Bay and Bolivar Peninsula will observe days of strong onshore winds. Although the latest the 4 a.m. National Hurricane Center advisory depicts Harvey eventually moving east as a tropical storm, after stalling for several days along the central Texas Coast, the text forecast and forecast discussion suggest that we should not focus on the exact track or intensity. If Harvey re-emerges into the Gulf of Mexico it could strengthen as it travels east, passing by places like Galveston with hurricane-force winds possibly on Tuesday night. The latest forecast discussions indicate that it is too early to tell if Harvey will re-emerge into the Gulf as it tracks east. There is a fine line between drifting just inland and drifting off the coast. The best we can tell for now is that Harvey will probably drive near the coast. The Aug 25 0000z ECMWF model run (Aug 24 7PM CDT) indicates Harvey could strengthen as it tracks along the coast next week. This model shows potential position and minimum air pressure at 700PM CDT on Wed Aug 30. 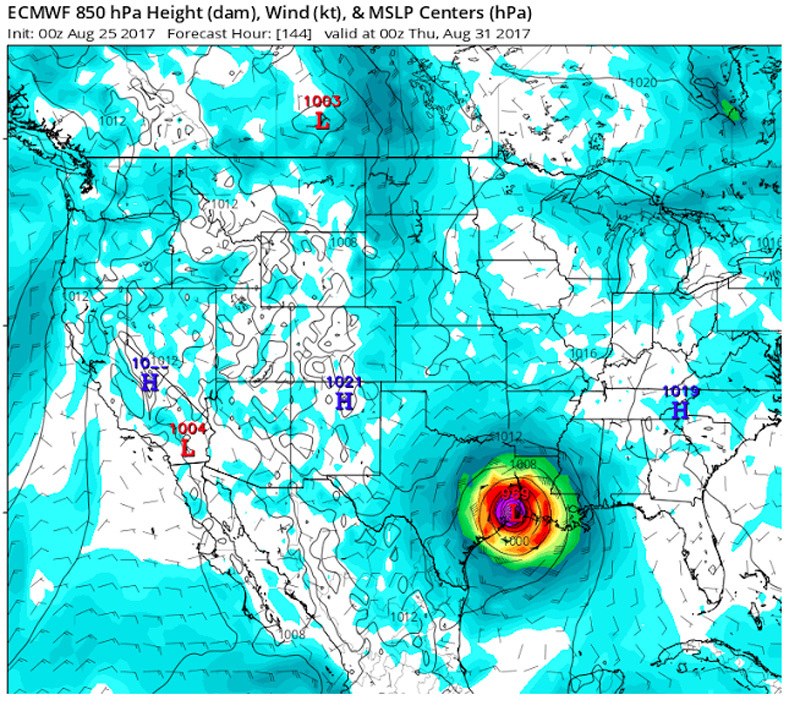 The latest runs of the GFS and ECMWF models, which are among the most reliable global models, suggest that Harvey may indeed re-emerge into the Gulf of Mexico after stalling and gain strength as it tracks east early next week. This potential scenario, which is becoming more likely, would result in Galveston Bay being elevated with at least several feet of storm surge for a prolonged period of possibly days. If Harvey's passes closest to Galveston as a hurricane, it's powerful right eyewall would push considerable water into Galveston Bay. Catastrophic compound (rain/surge) flooding may occur where storm surge impedes torrential rains from running off into places like Galveston Bay. The yellow area depicts a battle ground where fresh water and salt water could collide. The collision of these ingredients looks like a train and car headed for an intersection on the tracks. If Galveston Bay is raised by several feet for many days, and a wide area of Texas real estate receives 15-20 or more inches of rain, where is that rain going to go? Runoff into Galveston Bay and Galveston Harbor will be severely impeded and this will create a catastrophic compound flood event. Potential storm surge flooding from Hurricane Harvey. 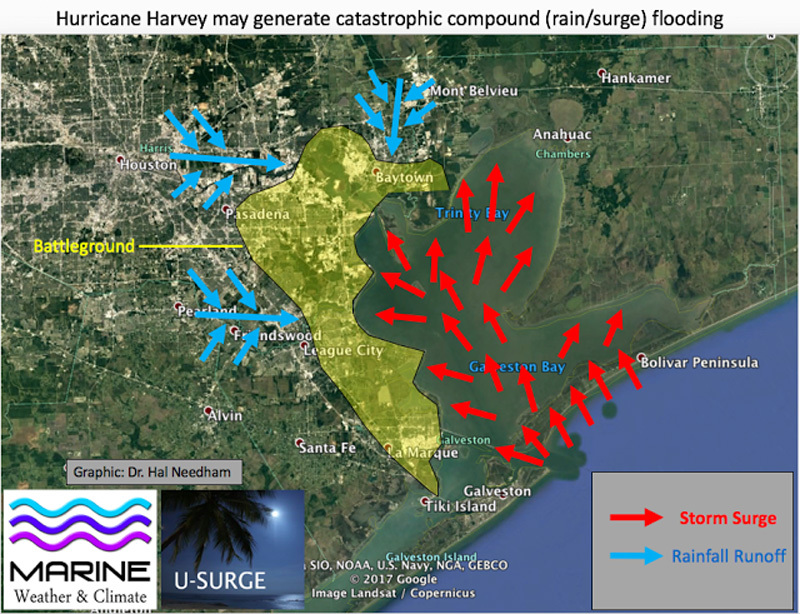 The graphic above shows a possible scenario where storm surge would impede heavy rainfall runoff. The yellow region, labeled "battleground" is not an actual floodplain for flood zone, but just a generalized area of heightened flood risk. Major and catastrophic flooding could potentially occur across a widespread area of Texas. It's a simplified graphic to demonstrate what happens when incoming surge and outgoing rainfall runoff meet. There's nowhere for the water to go but up. 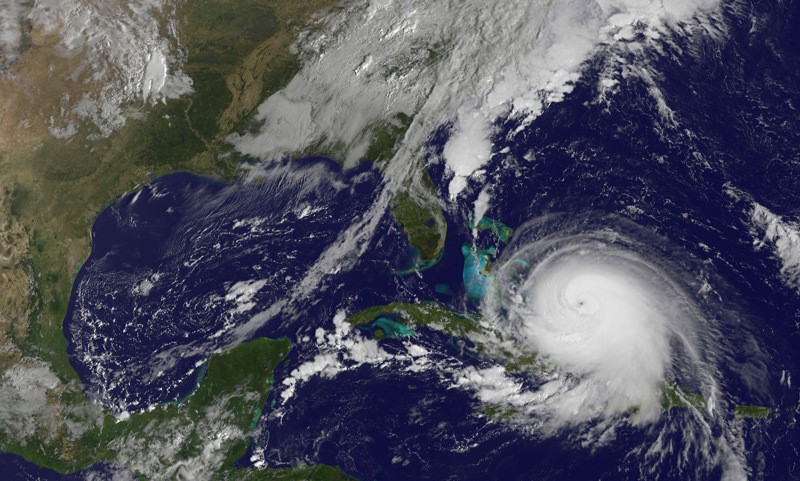 The National Hurricane Center has launched products to help us discern the risk of storm surge flooding, and these products, along with the newly released storm surge watches and warnings, are welcome innovations that will improve decision making. However, these products would be even more effective if they provided the potential for actual water levels- not just storm surge. For example, on the map below, shaded areas display the storm surge height that has about a 10 percent chance of being exceeded through early Monday morning. This mapped product is high resolution and provides practical information that will help decision making. The map clearly states what it is mapping — the area with at least a 10% chance of storm surge flooding. However, this map only extends until 4:00 a.m. local time on Monday. It is likely that Harvey's highest surge levels will arrive after that time near Galveston Bay. 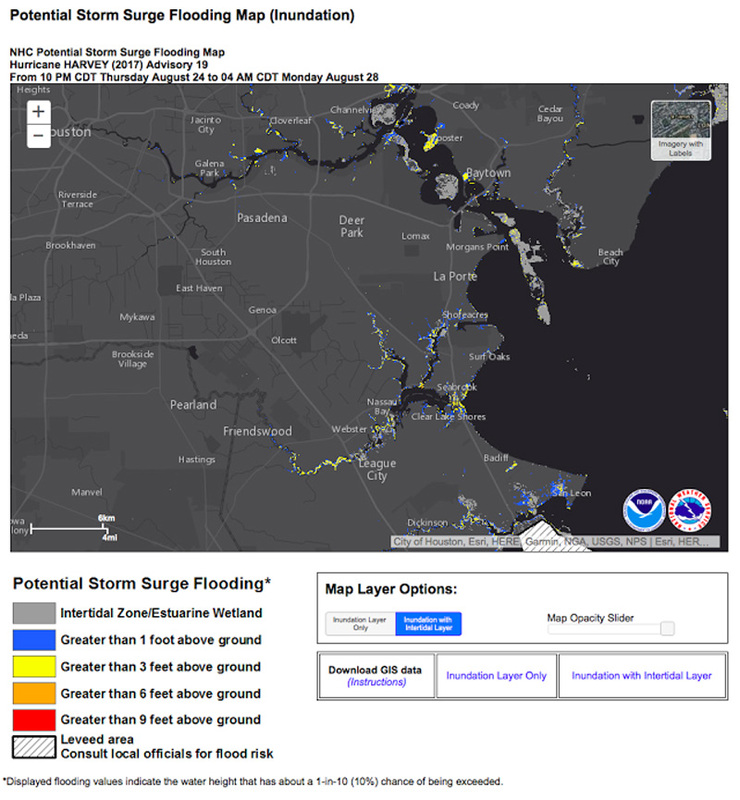 Even if this map captured the peak surge levels, it only maps the potential extent of storm surge inundation. It tells us nothing about compound rain-surge flooding, which, in Harvey's case, may be catastrophic. Although compound flooding is complex, such products could clarify that they only represent saltwater inundation and that actual freshwater and saltwater levels may be considerably higher. Otherwise, we get the impression that flood water will mostly stay near the bayou and inlet channels. However, if this region and regions inland receive 15-20 or more inches of rain and the bay, inlets and channels are at bank-full with saltwater, much of this map will be submerged under freshwater. If I'm a homeowner in League City, Texas, I don't care so much if freshwater or saltwater is inundating my home. I just want to know the likelihood of flooding. From my understanding, local authorities issue evacuation decisions based on such official products, so a mis-communication of flood risk at the "top" disseminates to the general public. 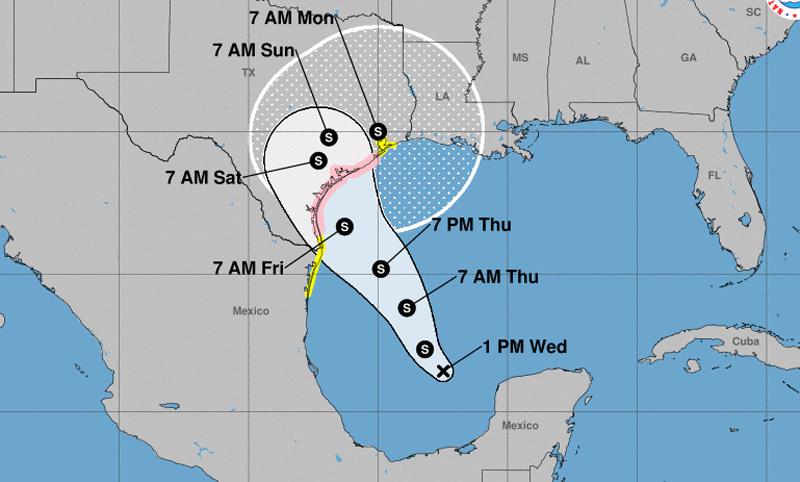 From personal correspondence with people in the western communities of Galveston Bay, most people are staying put and getting supplies ready, but not anticipating flood levels could come anywhere near Ike. However, compound flooding has the potential to flood locations that did not flood during Ike and inflict a widespread and long-term catastrophe that could last into the better part of next week. Tropical Storm Debby (2012) and Hurricane Isaac (2012) provided fairly recent examples of the power of compound flooding along the Gulf Coast. Debby generated substantial flooding in western Florida, including the Tampa-St. Petersburg area, where heavy rainfall could not drain effectively into Tampa Bay. Hurricane Isaac generated a much greater compound flood. Isaac shocked locals when it flooded some areas near New Orleans that did not flood during Hurricane Katrina (2005). However, Isaac raised the level of Lake Pontchartrain at Mandeville for than 3.28 feet for 68 consecutive hours. The elevated Lake level impeded widespread rain exceeding 10 inches, causing substantial flooding in places like Laplace, where as many as 4,000 water rescues were required. Harvey threatens to inflict a catastrophic flood event that far surpasses previous examples. This blog post focused on areas that are receiving water from three directions: saltwater surge, riverine flooding from inland and heavy rainfall from above. Galveston Island and the Bolivar Peninsula don't experience river drainage, so they don't quite fit the example. It is highly unlikely that the Bolivar Peninsula will experience anything rivaling Ike, because Ike leveled the Peninsula with a fast-moving surge reaching at least 17.5 feet. I've seen substantial street flooding in downtown Galveston at least five times in the past 18 months. I would expect substantial flooding on the island, particularly north of Broadway, perhaps rivaling Ike in some places if all the ingredients come together and Harvey remains strong as it tracks east. This blog post focused considerably on the Houston-Galveston corridor. The main idea of the post could be applied elsewhere. Compound flooding will likely impact a huge area of coastal Texas and possibly even southwest Louisiana. Harvey is forecast to be a long-term event, with conditions deteriorating along the Texas Coast throughout the day on Friday. If you are threatened by storm surge, rainfall or compound surge-rain flooding, take precautions immediately. If you live in the areas mentioned in this blog post, prepare yourself for inundation, even if your home never flooded before. I have received many messages requesting evacuation advice in the past 36 hours. I could not reply to most of them. In general, I like informing people about potential risks and then letting them make their own decisions. The idea of this post is to arm you with information, not tell you if you should evacuate or not. If you find yourself in a flood zone, beware of severe hazards in the water. This is such a widespread flood that numerous pests (snakes, spiders, fire ant colonies) will float on the water and try to find dry ground. The water near you could be severely polluted with chemicals, sewage or other hazards. Cuts exposed to flood water can easily get infected and require immediate medical attention. I am not trying to hype up this situation. 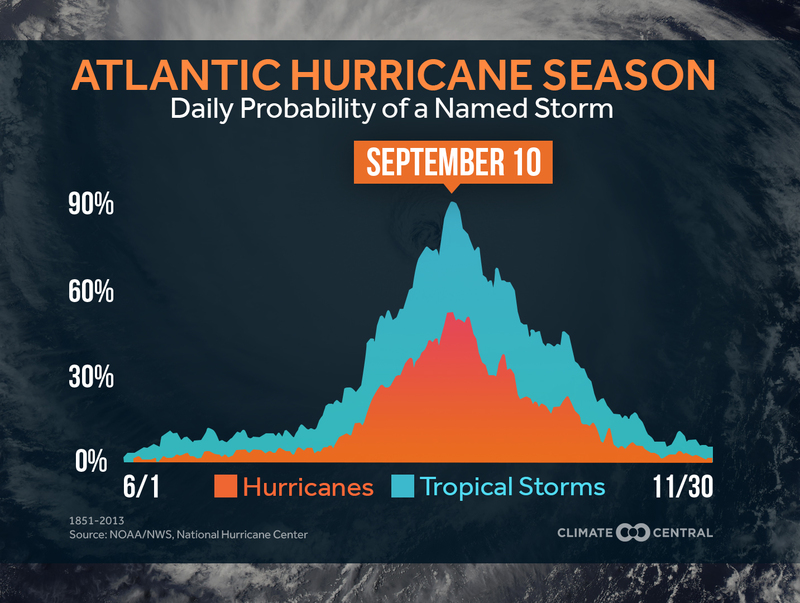 I am a huge fan of the National Weather Service and National Hurricane Center. I grew up listening to NOAA Weather Radio every night. I have had the sincere pleasure of working closely with colleagues and friends that are affiliated with NOAA. I love the new products that the National Hurricane Center is rolling out, but I felt I needed to explain how the surge inundation product could be misinterpreted and threaten people's lives. Even if you never heard of this product before, it is likely that your local officials are using this information as guidance. I respect that. We have amazing local authorities in southeast Texas. I just felt I needed to speak out. I am writing this blog post because it passed the "grandma" test. I asked myself if my grandma lived in a high compound-flooding risk area if I would speak up, and then I realized I would be going to her house immediately and urging her to take precautions. If my grandma lived in southeast Houston, Galveston, Bolivar, or any of the communities west of Galveston Bay, I would feel uneasy about her safety during this long-duration storm and feel much better if she evacuated at least north or west of Houston. I hope more than anyone that this catastrophic scenario does not pan out. If you want to talk about all this after the storm passes, give me a shout, and we can get together. Or better yet, come to Galveston and join me on my hurricane tour. OK, it's 4:49 a.m. on Friday morning and I'm finally going to bed for a few hours. I will re-emerge later this morning. Take care, everyone. This is a long-duration storm, and for many areas, especially east of landfall, the worst may not arrive until Tuesday, or even Wednesday.